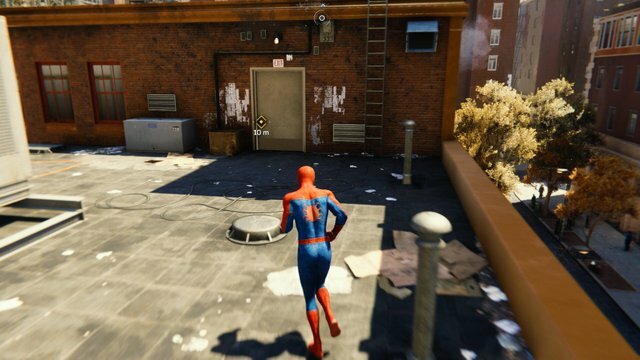 Look at you, taking down powerful boss Fisk in his own Tower, good for you. You have increased your level and earned a skill point. Before you move any further in the story-line, it is important to gear up some. 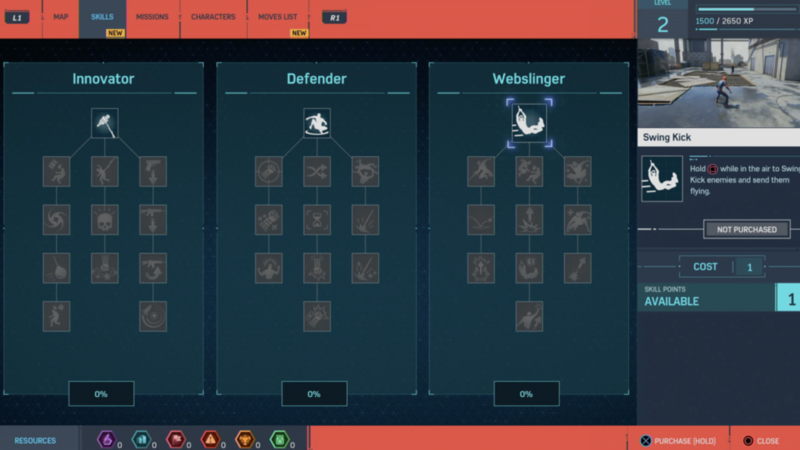 You have three skills to choose from at this point: Innovator, Defender or Webslinger. Things are not set to default and these abilities are there so you can choose the on that fits into your play style. Benchmarks are also unlocked now and these are like stats that measure your progress and everything from combat efficiency and distance traveled and all that jazz, you will gain xp for filling them up. Now, let’s get back to the action shall we. Peter is a superhero but he does have a day job. He is working as a research assistant and he has to get to work or that wallet might be the one with webs in it. Focusing on rooftops to zip by using L2 + R2 then tap X to boost off of the points and gain some speed in air. This technique is so much more than simply covering great distances, and you should be really well versed with it by now. Running along the walls work too but its not as much fun in my opinion. It can be disorienting running along the walls I think. So, stick to air zipping. Land on the roof top of the laboratory in Greenwich and enter through the rooftop door to don the costume. 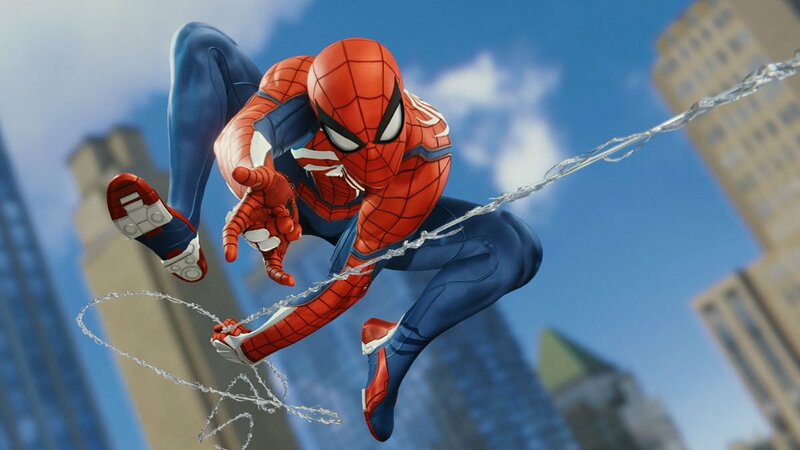 Now you are not Spider-Man anymore, well you are but not to the world, you are Peter Parker. 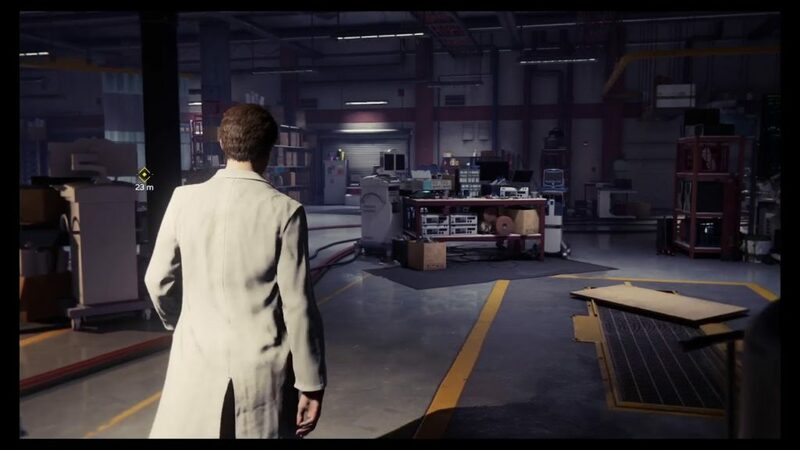 As Peter enters the lab, he will meet a doctor and if you know anything about Comic books or have watched Spider-Man movies then you will recognize the person. The doctor seems busy conducting an experiment which will not end well, to say the least. 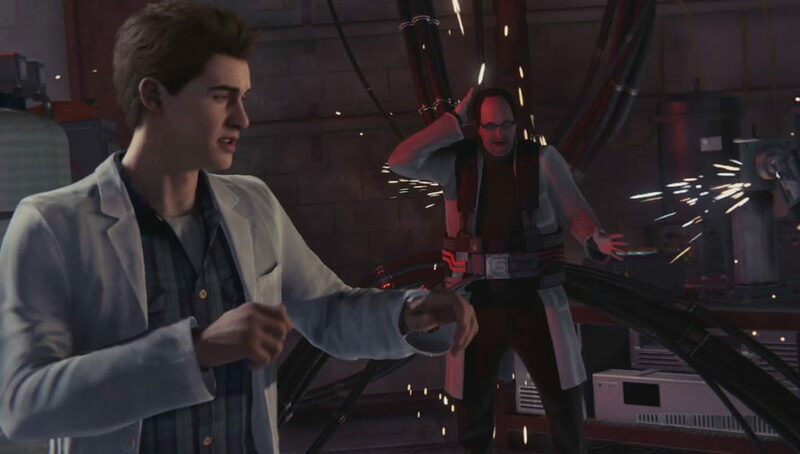 Doctor will leave to attend a meeting while Peter will decide to help out by checking the equipment and what happened during the test. 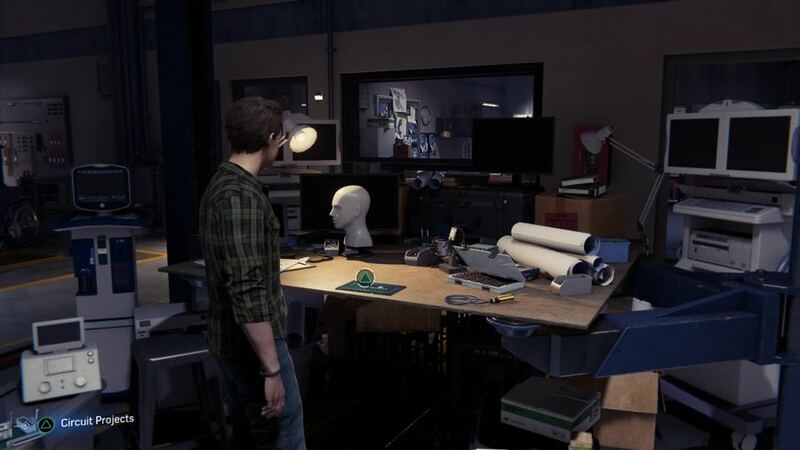 You can see a robotic arm placed on a table, approach it to inspect it closely. There is something right next to the arm, like a console of sorts, press triangle to find out what happened to it. You will realize that some parts of the console have malfunctioned and this is where you will enter the mini-game to fix them. You will be taken into a screen that will show circuits of sorts. You will have to connect and restore the relay. starting points are marked as green and the out points as orange. Try different ways until you arrange them in a proper order. Some circuits have specific in and out flow points noted by the yellow points or arrows, this shows the flow from start point to finish. Don’t worry about the blank spaces, these are lock points and are useless. You will have to put three of these puzzle in order to move forward. I can show you how but I think, you ought to do this by yourself. It is a brain teaser but it is also a good thing to work that brain a little. Now that you have fixed the console, you have allowed the arm to go online and it is a win. But your job is not over yet, you need to go to the Spectrograph Station on the opposite side of the lab. 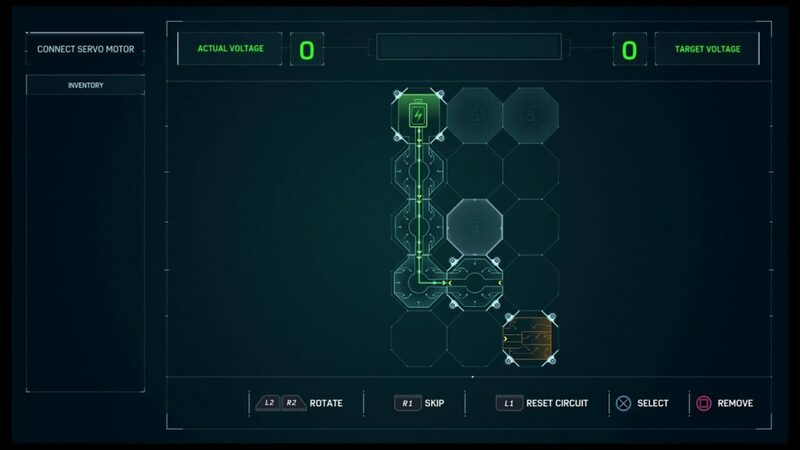 Like the other station, this features a similar mini-game puzzle situation. It may seem simple but it can throw you into a loop, trust me I had me a few times. 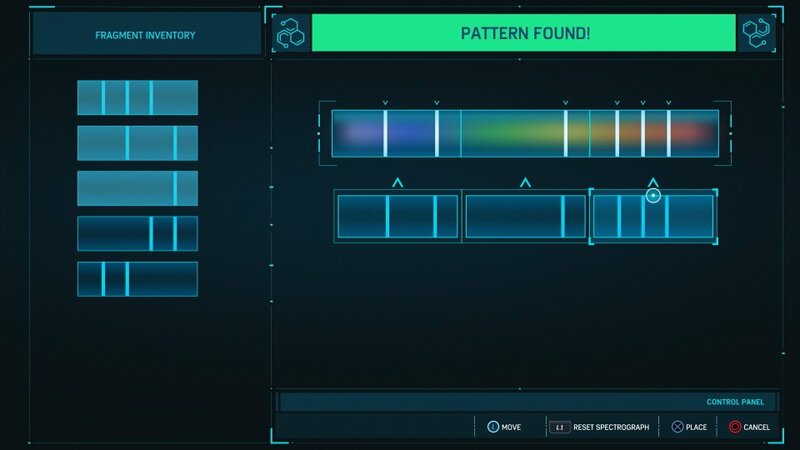 You have to match the patterns presented by looking for similar fragment lines in your inventory and link them up. It is divided into three parts: the left spectrum has two spaced lines, a middle and right one. The second only has one line all the way on the right. The final one has three lines, all skewed towards the left side. Arrange these lines to match both and you will see ‘Pattern Found’ written with a green light up top. After this, you can look for other side projects laying around the lab – both Spectrographs located at the same station and Circuit Projects located in the middle of the room near the mannequin head. Completing these mini-games will get you xp points and with that more items and upgrades will unlocked. There are some areas that still need a bit of exploring before you head out. You need to find the coffee maker and the radio in the kitchen, there are two audio recordings from the Doc close to Spectrograph Station, a magazine and a picture that you can inspect in Peter’s room and lastly there is a patient sheet on their first test subject located outside Peter’s room. You can also snoop around and listen to the conversation Doc is having with Grant Committee, it can give you some clues per the story but nothing important.